When I became a wedding officiant in Los Angeles, I thought I’d be called on pretty quickly for lesbian and gay weddings. I finally have my first tentative lesbian wedding booked…for the summer of 2012. I also thought I’d be doing wacky themed weddings, being in Hollywood where all manner of creative, offbeat folks are getting married. None yet! Imagine my delight, then, when I read about Jo and Liz’s wedding, a couple in England who had a Mexican Dia de los Muertos, or Day of the Dead, theme. To top it off, Liz was in her wheelchair, and most their guests live with some form of disability, so the logistics were pretty complex! There were 170 guests present, at least half of whom were disabled. The room was like a health and safety time bomb and the seating plan a logistical nightmare. The wheelies and blinkies had to have enough space to move about freely. Our deaf friends had to sit near the front so they could lip read. The agoraphobics needed to sit at the back so they could escape. The assistance dogs had their own pen, as did the personal assistants. There isn’t a wedding planning book in existence that could have prepared us for this. 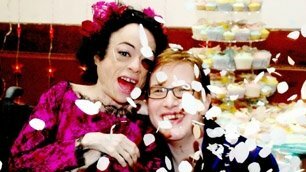 Read all about this festive wedding, especially for some great tips about disability-friendly weddings.